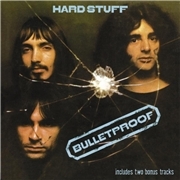 HARD STUFF was first known as BULLET, but changed to avoid confusion with an American band. Behind the words stood three experienced musicians with careers both behind an in the future; John DuCann, guitars/vocals, (ex ATTACK, ex. ANDROMEDA, ex. ATOMIC ROOSTER), Paul Hammond, drums (ex. ATOMIC ROOSTER), and JOHN GUSTAFSON, bass (ex THE MERSEYBEATS, ex. QUATERMASS). A heavily touring band, often as support to DEEP PURPLE or URIAH HEEP, they almost ended up dead on the road in a car crash in Germany. The band´s story was seriously hampered when DuCann and Hammond were seriously injured, and bedridden for long rendering them far too late with the follow-up to this 70´s success. Sadly a reunion is not in the cards since Paul succumbed to alcohol abuse in 1993 and DuCann prematurely passed away in September this year, R.I.P. Has the material stood the test of time? Opener “Jay Time” was the second single of the album. Cut in 1971 it represents the age and mind set well. A lot of “lala” compared to today and a sense of freedom is transferred. The remaster is extremely good for material that was recorded so long ago, quite simple but very convincing. The next track is “Sinister Minister”, a title that should win an award or two. DuCann actually used JIMI HENDRIX´s old Marshal and it kind of shines through. It may not be as unique as ATOMIC ROOSTER but the voice is instantly recognizableand the refrain rules. “No Witch at All” starts with a simple drum beat. There is a slight resemblance to the early DEEP PURPLE and the questioning tone in the lyrics seems familiar from many a seventies hit. I enjoy the arrangement and the slight crescendo towards the end. I may not be as thrilled about “Taken Alive”. A boogie a la STATUS QUO deep down it is not up to par with the three first tracks. The album is not as even as I would have liked. It contains a joint effort with Gillan/Glover, “Monster in Paradise” that doesn´t work any wondersand the rather forgettable “Mr Longevity – RIP”. But also the first single, “Hobo”, complete with a Coverdale like “whoohoo” and the archetypal flow of typical Brit rock called “Millionaire”. The jam character is of often present, especially in the far too short “The Provider Part One”. The bonus tracks are a completely mixed bag. The rare 7” version of “Jay Time” is shortened and more focused on being a hit, while the b-side “The Orchestrator” was left out from the album for an obvious reason. It´s odd and simply put a waste of time. Well, by the time I finished listening by jeans had widened by four inches at my feet and it is easy to get carried away by the happy-go-lucky 70´s feeling. I bet they saved my day somehow. John DuCann will no doubt be a great loss for British rock.